The US-built version features key-guards on the top row of function keys, while the Italian-built version has them only on the [ON/C] key. Even the battery doors are slightly different. Compare the technology with the TI-35 II introduced already in 1984. 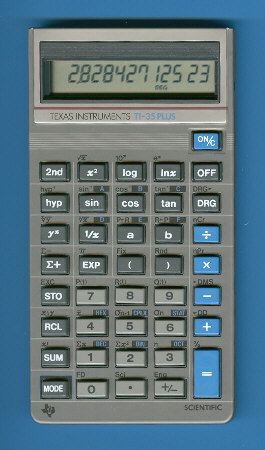 The TI-35 PLUS is featured in the Texas Instruments Incorporated bulletin CL-914 dated 1986.